"I am Neil Armstrong" by Brad Meltzer. It would be hard to find someone who doesn't know the name Neil Armstrong. He was the first person to ever set foot on the moon — a "reluctant American hero" who captured the world's attention alongside fellow astronauts Buzz Aldrin and Michael Collins in NASA's Apollo 11 mission. But Armstrong's life story, his journey from curious child to beloved astronaut, isn't as well-known. Neil Armstrong stands for a formal portrait. Armstrong, the "reluctant American hero" was the first human to ever set foot on the surface of the moon. In "I Am Neil Armstrong," a new children's book, Armstrong's story aims to inspire young people to work hard and get back up when they fall. In his book about Armstrong, Meltzer starts at the beginning. He opens with Armstrong as a young child in Ohio, climbing a silver maple tree, eager to get to the top. Grabbing a dead branch, the young Armstrong falls to the ground. But, as the book says, while Armstrong was devastated by the fall, "he does the most important thing of all. He gets back up,." Meltzer told Space.com. Meltzer wants young readers to walk away from this book knowing a little bit more about Armstrong's story, and he also hopes that they will be inspired by his hard work and the many difficult steps he actually took to get to the moon. "I Am Neil Armstrong" shows kids what it means to be an engineer, what it means to fall and get back up again and so much more. "This book isn't about just going to the moon," Meltzer told to Space.com. 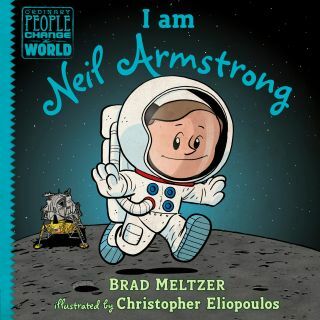 "I Am Neil Armstrong" by Brad Meltzer is available for purchase on Amazon.com.